3.0 out of 5 starsProduct is ok. Converting car to transformer is good and my kid likes that part. Product quality and finish is ok ok. Though no sharp edges. There is a note from seller on package that if u open then do not return the package. This is so rude. What if product is not good or defective and not meeting our expectations. This is not appreciated. Just as displays. It very nice quality product. Working perfectly as expected. I found the Transformer Toy car to be exceptionally unique, very nice in the design and execution and unbelievably reasonable in costing Less than 500). Once turned on the car roams around in random directions, Turns directions automatically if it hits any obstacle. The car transforms into a robot automatically while constantly moving. Very fascinating for a 3/4 year old, for whom it is still not possible to use a remote control car and all its functions. I am not sure what you are getting in Market at this price. Someone can go and compare. Overall product is OK.
On putting batteries, the car will start and it will turn into a robot which is very exciting for Kids. Good for Kids 3-7 yrs. I think if you want a better plastic quality, you may need to pay more. 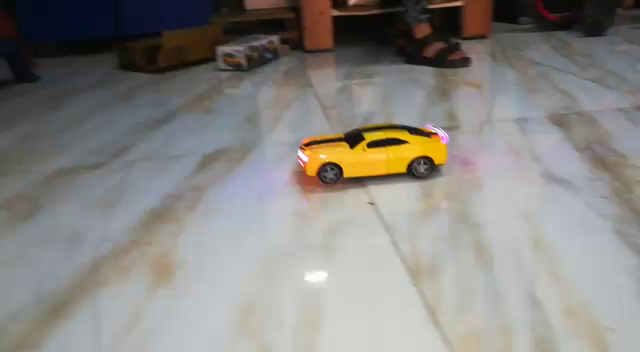 My 5year old nephew loves it,he always play with it and always asking" from where did you get this"I was like super happy to see his reaction.super transformation from car to robot and than car again,sounds and lights are amazing, Go for it guys your kid will definitely love it,My 2year old girl is also getting carzy about it,need to buy on more. No doubt. It is really very nice toy. My son is very Happy today to get the same. The plastic material is very good quality. And the batteries are not included with. People can buy it without any hurdle. Worth buying it. My son loved it. With discounted price of 299/-. 5.0 out of 5 starsMy sister's child love it. Better if the car moves around but it is not. It just makes music and change its shape to transformer and back to its normal car position again.